Building a custom canoe trailer for community organziations or even for your own float parties on the river can be very satisfying. A solid knowledge of welding, some steel, plywood, an old boat trailer and some imagination can yield a very nice, easy-to-use trailer to carry your canoe and kayak collection to your next float trip on the river. Wash down the trailer you are converting, and check the brake and running lights to make sure they meet legal requirements. Check the tires for wear and proper inflation. You can find old boat trailers around lakeside communities, and you may be able to obtain them for little or no cost. Look for one with as wide a wheelbase as possible. Some don't have titles, so you may have to get a builder's title from the registration office. Make sure the trailer is roadworthy before you start welding things together. Measure your boats to determine how wide and how long they are. Compare these measurements to the trailer to determine how long to make your crosstrees. Allow for the width of the supports in the center. Leave an extra 2 or 3 inches width beyond the edge of the canoe so you will have room to install eyebolts with which to tie down the canoe. Use a cutting torch to cut the 2 x 2 inch tube steel cross members to the proper length. You'll need six (three front and three back) for a six-place trailer, eight for an eight-place. If you don't use a cutting torch, mark everything and then take all the pieces at once to a welding shop to be cut. Measure the depth of your canoe from gunwhale to keel. Allow 3 inches or more for maneuver room - at least the height of the eyebolt you'll have sticking up on the end of the crosstrees. Add the space for the lower racks to the width of the crosstrees, and the distance the support will extend down into the trailer frame. Mark the 2 x 4 inch tube steel vertical supports for cutting. The top crosstree should be welded on top of the support post; don't allow for the width of the cross-member in the top section. Measure the distance between where you will weld the front and rear vertical 2 x 4 tube steel supports. Cut and mark the lengthwise 2 x 2 tube steel lengthwise cross-member (or -members if you elect to add a second lower one as shown). Place the uprights so that the crosstrees will pass under the canoes at no closer than the point where the canoe divides into thirds. Closer than that and the load will be tipsy front to back. Measure the distance between the front cross member and the trailer hitch. Allow at least 1/3 the length of your longest canoe (6 feet for an 18-foot canoe) plus another couple of feet to allow the vehicle to turn. If your trailer hitch is too short, you'll have to cut it off and extend it to an adequate length. Your welder can do that easily when he's welding the pieces together. Measure and cut the two marine-grade plywood sheets to construct a box bottom, sides and lid that will fit into the space. Drill 4 1/2-inch holes in the frame, two on each end, to bolt the box in place. Screw the pieces of the bottom of the box and sides together and fit into place in the trailer frame. Attach the lid with hinges and hasp as sown in the picture. You'll want to lock the box when the trailer is left unattended. Some like a vertical box because you don't have to unload a canoe to open it. The wind pressure against a broad expanse of plywood on narrow roads can make your trailer dance around dangerously. For safety, lay the box flat. It's not that hard to unload the bottom canoe. Paint or varnish the box with marine varnish to protect it. Lay out the crosstrees and clamp them in place on the two uprights. Mark where the two support straps (if you use them) and the lengthwise cross-members attach. Test fit the pieces in the places they go. Make sure everything lines up before you weld it together. Correct any problems, measurements or alignments. Don't forget the gusset plates. Carry the trailer and clamped pieces to the welder or weld them up yourself if you have the skill. Because the trailer is made of steel, it will be heavier than an aluminum or factory-made trailer. A good recommendation is limiting it to six places. 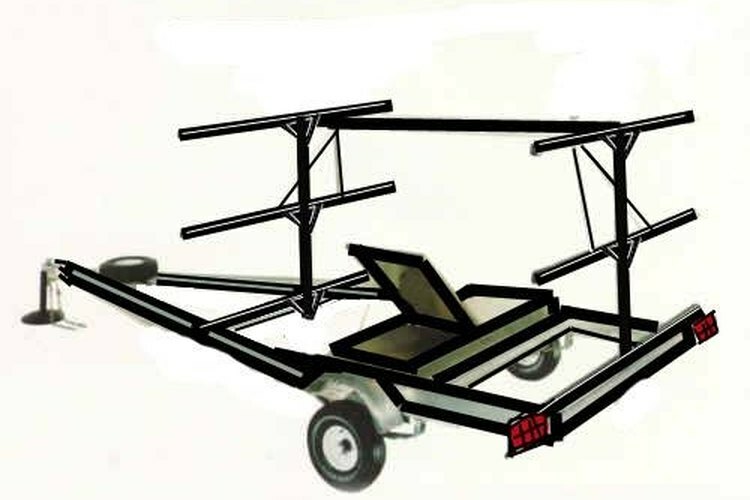 An eight-place trailer may be a little top heavy when fully loaded and could strain the boat trailer. Have the welder attach eye-bolts to the ends of each cross member to provide handy tie-down points. When the uprights and cross trees are welded in place, paint the trailer with primer, then a good paint for metal in whatever color you choose. Brighter colors help people to see you when approaching from the rear. Load the trailer with canoes and take it for a test drive. Measure twice, cut once Have your welder check your work to make sure everything lines up properly. It's better to overbuild than underbuild. There's nothing worse than a broken support and a load of canoes skipping down the freeway. Don't build more on top than your trailer can safely balance. Top-heavy canoe trailers can be very dangerous to drive, especially on small, twisting back roads.